"Something Good This Way Comes"
‘Cause I know something good this way comes..."
Well, something good this way came! My mister is the best ever! 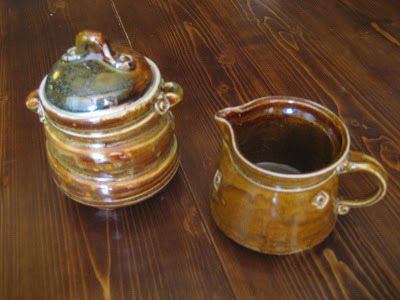 He bought me a creamer & sugar set from MudStuffing ~>my absolute favorite seller on Etsy! Chris says I have a crush on him...is there such thing as a "pottery crush"? If there is, I totally have a pottery crush on that guy! Since I sold my entire set of dishes a few months ago, I have been needing (OK, wanting) a few items to replace the completer set that came with it. 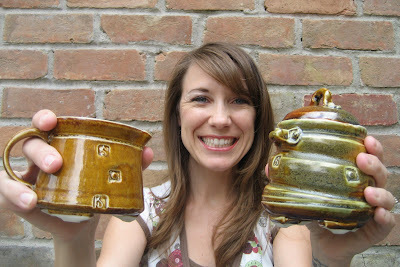 So I've been sorta stalking my pottery crush's shop, occasionally reading his blog & longing for a piece of his pottery. Well, what do you know?...he put this set on sale last week! Anyone want to come over for coffee? "Best Night of Our Lives"
"How Could I Ask For More?" "Give Until There's Nothing Left"